Your Pittsburgh movers of choice is All Ways Moving & Storage®! We have been preferred Pittsburgh movers for over a century. Pittsburgh, Pennsylvania is known for its bridges, skyscrapers, inclined railways, and most notably being at the confluence of the Allegheny, Monongahela, and Ohio rivers. 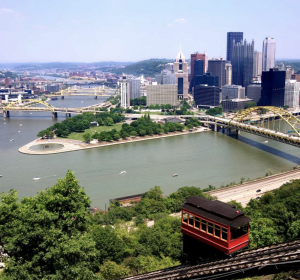 There is so much to do and see in Pittsburgh, there is truly something for everyone in this amazing city. Home of the Cathedral of Learning, Heinz Field, and Phipps Conservatory to name only a few. Quality Pittsburgh Movers you can Trust! The internet is scattered with hundreds of companies claiming to be professional movers. The most valuable thing you can do before selecting a Pittsburgh mover is to do your research! By choosing All Ways Moving & Storage® for your upcoming move you will have the confidence of knowing you have selected a moving company that is fully licensed, insured, rated highly by consumers, and has the expertise to complete your move the right way. Big or small, we offer a wide range of services for your local or long distance move. If you don’t have the time or ability to pack your household, we can provide full packing services. Don’t want to have your entire household packed, but have several delicate items you aren’t comfortable packing? We can also provide partial packs before or during moving day. If you are in need of storage for your household goods before moving to your final destination we also offer secure storage and delivery out of storage. All of our warehouse facilities are utilized by the Department of Defense and have routine daily, weekly, and monthly inspections.